“I know I chatter on way too much…but if you only know how many things I want to say and don’t,” exclaimed Anne, the fictional, red-haired orphan from Cavendish on Prince Edward Island, Canada. Green Gables is the house where author, Lucy Maud Montgomery, drew her inspiration for writing the famous children’s story, Anne of Green Gables, way back in 1903. Since the book has sold over 50 million copies, it is understandable that the area has been developed as a tourist attraction with Anne at its center. According to this old tale, Anne was an orphan adopted by a brother and sister on Prince Edward Island. She was always an imaginative, redheaded girl and quite the chatterbox. This is the story of her growing up in Avonlea and eventually teaching at the Avonlea School. 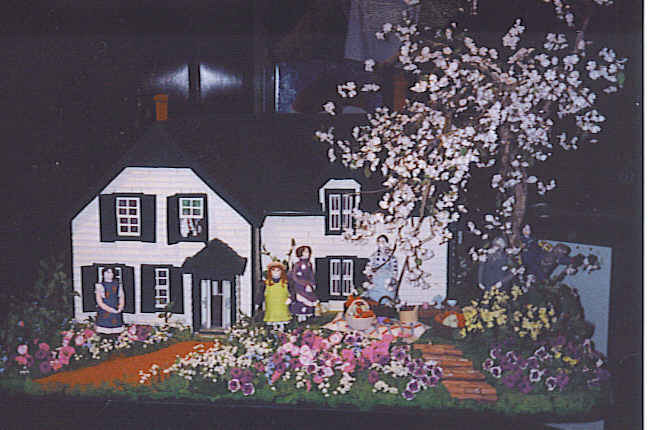 Inside Green Gables, there was a beautiful cake designed to image the house with all edible decorations. Hopefully, it was flavored with vanilla, and not liniment that Anne accidentally once used in her cake. Within walking distance are Balsam Hollow and the forest that inspired Haunted Woods. Sometimes it is very relaxing to get away from the excitement of the day and stroll through the woods where Nature’s peace will surround you. 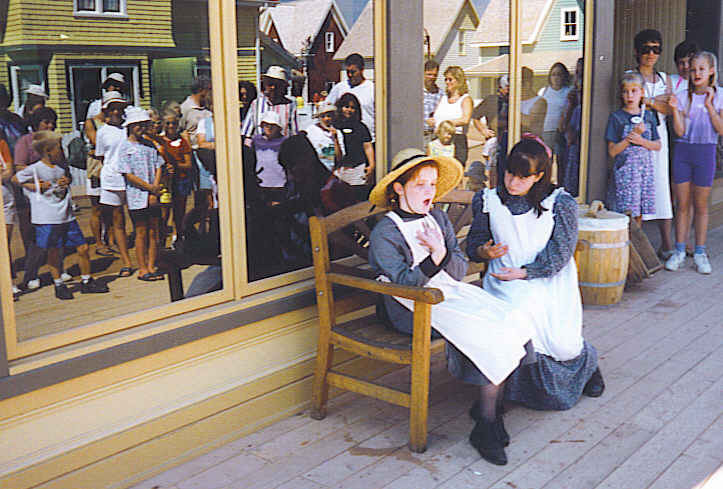 The nearby town of Avonlea is the place that Anne went to church and school. Throughout the village, bits of the story were being performed along the street and had pretty much stopped traffic, at least the walking kind. 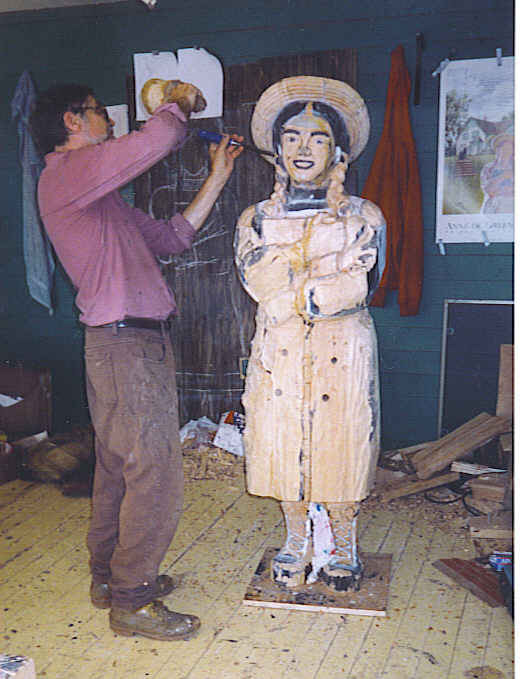 In one small shop, a woodcarver was cutting a five foot wood sculpture of Anne. In the evening watched a local Variety Show which included everything from ballads to step dancing to fiddling. There was even a surprise performance by a local legend, who just happened to be in the audience that night. Surprises always make these road trips more exciting. Drove on to Charlottetown, the big city on the island, with 32,500 people. Visited a beautiful Art Gallery as well as Confederation Shopping Center, which covered three levels over a city block. Then on to a very interesting and well done performance of “Anne of Green Gables“, the musical version, at the Confederation Centre Theater. 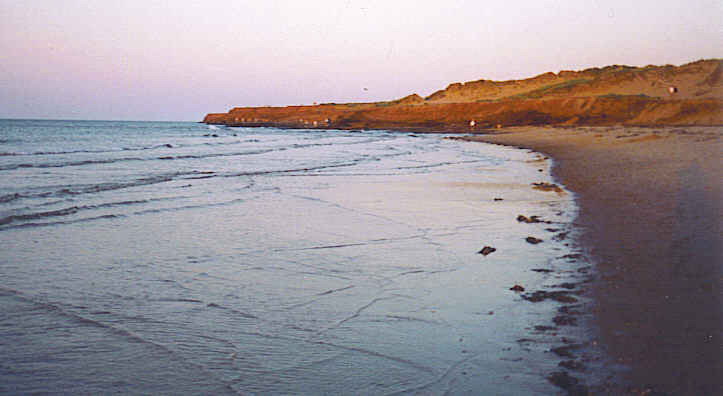 Beaches naturally abound on the island and one of the most intriguing is The Singing Sands Beach at Basin Head. Here the waves don’t actually break in close to the beach, they just hum in. It is a mystical place to slip off your shoes and take a long walk. On down the road, red sandstone cliffs make for a scenic Cavendish Beach walk along the beautiful Gulf of St Lawrence. Great place to read a good book, or go for a sunset stroll to relax from all the cares of the day, and think peaceful thoughts…or maybe plan your next road trip.